Although requiring further examination, the latest studies (conducted by the University of Otago Human Performance Centre on behalf of NZGIB and AgResearch) do indicate a possible link between New Zealand deer velvet and assisting athletic performance. Results show improved strength and muscle endurance in response to training, and improved recovery from muscle tissue damage associated with exercise. In the first study, scientists at University of Otago Human Performance Centre compared the development of muscle strength and endurance in groups of males taking different forms of New Zealand deer velvet to a control group taking a placebo. In the study, 51 male athletes undertook a 12 week period of supervised training during which strength and muscular endurance were monitored. The isokinetic strength of the group taking a powdered form of New Zealand deer velvet was assisted more as a result of training in comparison to the control group. The second study was designed to determine what role New Zealand deer velvet has in athletic performance by supporting recovery from muscle injury. A substance found in the bloodstream called creatine kinase, was used as an indicator of muscle tissue damage. The thirty athletes in the trial ran downhill on a treadmill to induce tissue damage in the muscles at the front of their thighs. Blood samples were then taken for measurement of creatine kinase. Those athletes who had been on a course of New Zealand deer velvet powder for two weeks previously showed significantly reduced elevation of creatine kinase levels in their bloodstream, possibly indicating better supported muscles. A trend also emerged in which athletes taking powdered New Zealand deer velvet reported a recovery from muscle soreness 24 hours earlier than the subjects receiving a placebo. The benefit of this is that they could return to training more quickly. While not yet being a complete picture, the statistically significant results certainly bode well for further research. Deer velvet is one of the few products where New Zealand accounts for the majority of world trade and any further significant advances in the uses of deer velvet will be excellent news for the industry and the New Zealand economy as a whole. The research was commissioned by Velvet Antler Research of New Zealand – a joint venture between the New Zealand Game Industry Board and AgResearch. 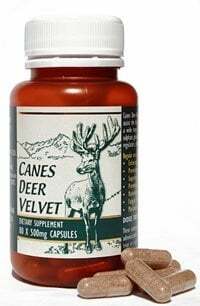 Awareness of New Zealand Deer Velvet and its benefits is already high among New Zealand athletes. Hamish Carter, previously number one ranked triathlete in the World, is a firm advocate.